Skipping is a terrific cardio workout – seriously, I don’t know how those little kids do it for so long! 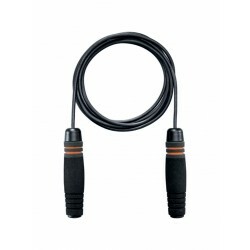 But if you’re keen to up the ante, consider a weighted skipping rope, like this Nike Weighted Rope. The weight is all in the handles of the rope, making your arms work harder. Generally the weight seems negligible when you first pick it up, but after a couple of minutes skipping they’re feeling a good deal heavier! It’s a relatively simple change, that can make a big difference to your workout over time.